Time keeps on slippin’, slippin’, slippin’, into the future. Listening to music is clearly one of my favorite past times, but it can be even more special when the guy belting out tunes on the radio is from your hometown. Today’s featured band has an artist who was born in good old Milwaukee, Wisconsin and has such an outstanding career, is enshrined in the Rock and Roll Hall of Fame. Steve Miller was born in Milwaukee in 1943. His mother was a remarkable jazz-influenced singer and his father was a doctor but also dabbled in music. Mom and dad were friends with a guitar virtuoso and fellow Milwaukee native, Les Paul—close enough to be the best man and maid of honor at his wedding—which speaks to Steve’s musical background and influence. After playing with some smaller, local bands, in the mid-60s, Miller and keyboardist Barry Goldberg moved to Chicago to start a blues band. They found a couple more guys, got signed, and even picked up a record deal with a major label. After less than a year, Miller realized his heart wasn’t in it, and decided to head to greener pastures in San Francisco and formed his own band—the Steve Miller Band. Because of his name recognition in the industry, he was signed to a contract with Capitol/EMI Records. They played a few local shows and festivals, and it seemed they were finding their sound. The label sent them to tour England and record their debut record which came out in 1968. While the first couple albums weren’t huge, the records kept getting better and better—both in terms of quality and sales. Everyone felt it was simply a matter of time before they hit it big. In ’73 the single “The Joker” hit major radio and really put the band on the map. 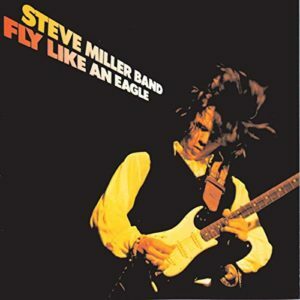 Today I’m listening to the follow up to that album, Fly Like An Eagle which was released in May of 1976. Expectations were higher with their recent success, and they hit them head on. The album spawned three Billboard 200 singles and the sales were solid. The album was sold nearly 10 million copies worldwide, which makes it the highest-selling Steve Miller record of all time. Rolling Stone has it the 445th best album of all time on their Top 500 list. Critically, they enjoyed the mixture of originals and old school blues covers. The album has an overall mellow feel, relatively signature to Steve Miller, but holds true to his origins in blues as well—just with that Steve Miller spin on it. It’s easy to hear Steve Miller Band and think of maybe one or two hits and sort of disregard them within music history. But in reality, these guys are everywhere. They have so many hits (some of which you might not even realize are them) and their music has played such a major role in music, movies, TV and commercials. Their sound is very unique, especially given the time in which they were incredibly popular. To label them a rock band is a bit off the mark for me—they’re more than that. You get that blues element, which is nice, but the special part is how they blended that with the psychedelic rock style. And even on an album like this, you get three or four different styles on one album. The title track opens with that almost experimental sounding psych rock and then a monster single track like “Rock’n Me” shows you the straight chops they have in the commercial rock department. The versatility is truly what has made Steve Miller Band such a mainstay on my rotation for such a long time. In spite of going through countless musicians (seriously, I lost count at 30), they are still out there, touring and playing music all around the world. They haven’t put out any new music in some time, but you can always hear the classics. They went from Phoenix, Arizona all the way to Tacoma, Philadelphia, Atlanta, L.A. – and put on a great show in every city. Give Fly Like An Eagle a shot today and, for a mere $6.69, take the money and run! WJXT is coming to the Georgia TDS TV lineup! Not only was Miller born in Milwaukee, he attended UW Madison for awhile. One of his first bands was with Ken Adamany (later went on to manage Cheap Trick), Boz Skaggs, Ben Sidran (local jazz legend), and on drums Ron Boyer, the owner of the Village Green in Middleton. There used to be a picture in the back of the bar of that early Steve Miller group. Thanks for the cheap tunes articles! Indeed!! So many great facts about Steve Miller and underappreciated tunes! Thanks for the comment Erik!